Place kale pieces into a large bowl. Drizzle with olive oil and toss to coat. Sprinkle on cheese and toss again to get an even distribution. Line 2 baking sheets with foil. Spray foil with non-stick spray. Spread kale pieces onto baking sheets, making sure they are in a single layer. Bake in preheated oven for 25 minutes. Rotate pans and flip the chips. They should be slightly crisp. Bake another 25 minutes, checking frequently to make sure they don't burn. Remove when chips are crisp and sprinkle with salt as desired. Toast pine nuts in a dry skillet over medium-low heat about 5 minutes or until golden brown. Remove pine nuts from skillet and let cool. In the same skillet, melt butter over medium heat. Add kale and saute about 10 minutes or until tender. 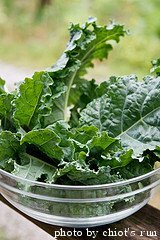 Pile kale into serving bowl and toss with pine nuts, vinegar and Parmesan cheese. Serve immediately. Heat large pot over medium-high heat. Add sausage and onions and cook until sausage is browned. Drain and return sausage and onions to pot. Add half-and-half, potatoes, broth, milk, oregano and red pepper flakes. Stir and bring to a boil. Reduce heat and simmer until potatoes are tender, about 25 minutes. Season with salt and pepper. Add kale and simmer another 10 minutes or until kale is tender. Serve immediately. Add the oil to a skillet and put over medium heat. Add kale and saute5 minutes, until kale is warmed through and barely starts to soften. Remove from heat. In a large bowl, whisk together lemon juice, olive oil, honey, salt and pepper. Add kale, tomato, almonds and cranberries. Toss to combine and serve. Heat olive oil and butter in a skillet over medium heat. Add kale, onion, mushrooms, bell pepper and garlic. Saute until onion and kale is tender, about 7 minutes. Add rice to mixture and stir to break up the grains. Add salt, pepper and hot pepper sauce and cook until rice is hot, stirring constantly so it doesn't burn. Serve immediately.